The AR-15 is one of the most popular and talked-about semi-auto rifles, but not many people know that it was originally derived from the AR-10. These two guns have many fans and adherents, so today we’ll talk about the history of these rifles, their features, and variants, and then compare them both, to learn about their similarities and differences. We’ll also mention our top pick between these two and help you decide which one to opt for in your particular case. The ArmaLite AR-10 is a battle rifle first introduced by ArmaLite in 1956 and used an innovative straight-line barrel/stock design with composite and alloy parts. This design resulted in a small arm that was over 1 lb lighter than other infantry rifles of the day, and significantly easier to control in automatic fire. The AR-10 is air-cooled, and gas operated and fires the NATO standardized 7.62x51mm cartridge in a 20-round detachable box magazine. While the original AR-10 was built in relatively small numbers over its production run,, it was hugely influential in the development of the AR-15. The AR-10 was originally designed for use by the paratroopers in the US military, so it is supposed to be light and effective for survival. Let’s now take a detailed look at the AR-10’s design and what features it offers. In the AR-10, the gas travels from a port near the middle of the barrel through a steel tube back into the receiver. Next, it enters a chamber between the rear of the bolt and the inside of the bolt carrier. After pushing the bolt carrier to the rear, the excess gas vents through holes in its side. The main advantages of this design are improved accuracy from the bolt carrier movement and the lightness of the gun. The rifle is also kept on target after being fired. The simplified construction and weight saving design of the gas system, bolt carrier, and bolt-locking were ahead of its time when originally designed.. The rifle’s sights are mounted high, while the rear sight is contained in a carrying handle that also protects the cocking/charging lever. The AR-10’s receiver is made from aluminum to reduce weight and the bolt locks into the extension on the barrel instead the receiver. All production AR-10s are fitted with standard steel barrels, while the stock is made from a composite reinforced fiberglass with a core of rigid plastic foam. The handguard and pistol grip are also fiberglass. The AR-15 is one of the world’s most popular semi-automatic rifles. The AR modular platform has made it extremely easy to customize and convert for various purposes. The AR-15 uses a 5.56x45mm M193 cartridge in 20 or 30-round magazines. Due to the extensive use of “mylonite” for its furniture, the AR-15 is light and weighs from 5.5 to 8.5 lbs. It has a cyclic rate of fire of 800 rounds a minute with a muzzle velocity of 3,200 feet per second to a maximum effective range of 600 yards. The AR-15 is around 39.63-inches long with a barrel length of 20-inches. The AR-15 is around 39” in length and has a barrel length of approximately 20”. 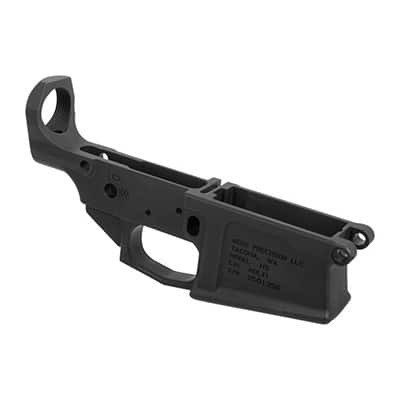 It is lighter than the AR-10 due to its shorter length and use of lightweight plastics. An AR-15 weighs around 6 to 7½ pounds in most cases. The AR-15 can accept two ammunition sizes, the Remington .223 round and a NATO 5.56mm round. A normal size magazine for the AR 15 holds 20 to 30 rounds, but again there are several variants to this. The advantage of the AR-15’s design is it’s high rate of fire, lightweight, and portability, and toughness. 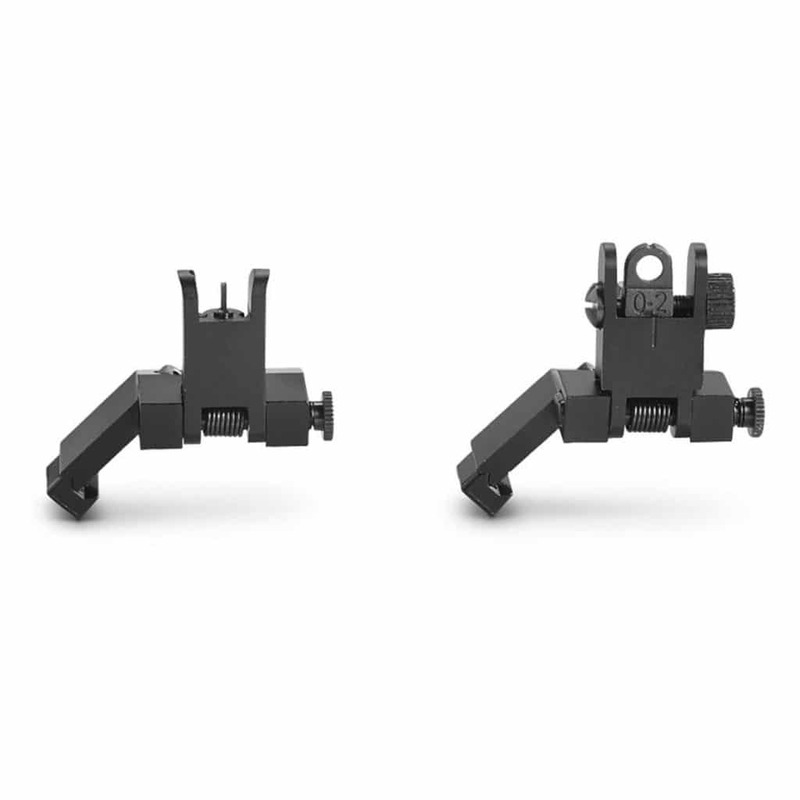 In addition, it is modular by design, so parts can be easily swapped out and upgraded. After Colt's patents expired in 1977, many other manufacturers started to produce and sell their own AR-15 style rifles. Next, we’ll take a look at some of the most popular and widely used AR-15 variants that have become successful in the firearms market. The REC7 is not an entirely new rifle, but consists of an M16 lower receiver mated to an upper receiver, both made from forged aluminum. 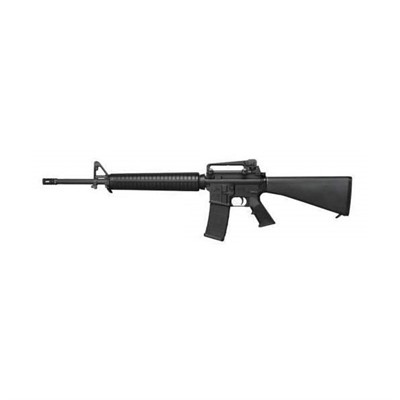 This gun is compatible with many of the accessories that work with members of the M16 family too. The rifle uses a short-stroke gas piston mechanism, unlike the M16’s direct impingement mechanism. 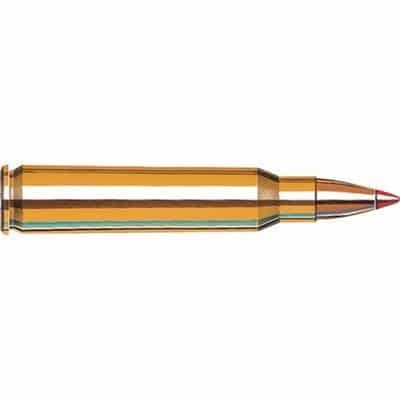 This variant uses the new 6.8mm Remington SPC (6.8×43mm) cartridge, around that is of roughly equivalent length to 5.56×45mm NATO ammunition. The REC7 has a threaded barrel to allow muzzle attachments such as a silencer and employs a free-floating Daniel Defense rail system. This rail system allows many military accessories such as a bipod, night vision devices, and combat optics to be placed on the rifle. This version is ideal for tactical and military usage, with its single-stage trigger, Magpul enhanced trigger guard, and beveled magazine well for rapid magazine changes. The upper receiver is flat-top with a Picatinny rail. The barrel is chrome-lined and is fitted with an M16A2 flash suppressor, a six-position Magpul MOE buttstock, and pistol grip. It has the major advantage of being highly compatible with accessories for the M16. 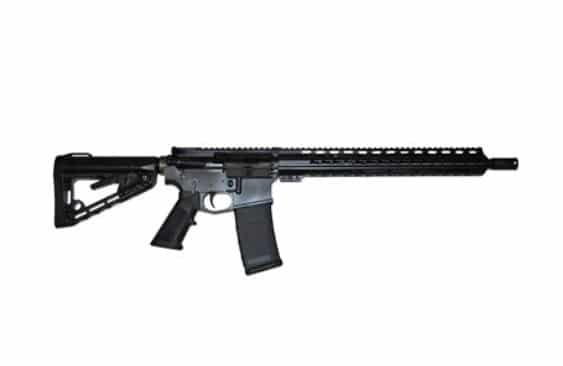 The Sturm, Ruger & Co. introduced their own AR-15 variant in 2009, the SR-556. They would later create a .308 AR-10 variant, the Ruger SR-762. The SR-556 uses a gas piston operation. Since 2014, this model has been replaced by the AR-556, a variant that utilizes traditional direct impingement action and introduces a rear flip up sight. In 2017, Ruger introduced the AR-556 MPR Multi-Purpose Rifle, which comes with a Magpul MOE grip, a Magpul MOE SL collapsible buttstock, a free-floating M-LOK handguard, a Ruger Elite 452 two-stage trigger, a nitrided cold hammer-forged barrel with 1:8" twist 5R rifling, rifle-length gas system, and a Ruger muzzle brake. This rifle has the advantage of using some very reliable and high-quality Magpul components, but the accessories range is not as extensive as for some other AR-15 variants out there. The SIG516 is a semi-automatic multi-caliber AR-15 clone for civilian and law enforcement markets. The law enforcement and military versions have selective-fired options: single shot, 3 shot burst, and fully automatic modes. The 516 has a four-position gas regulator, allowing the user to choose the amount of gas directed to the piston. What sets the SIG516 apart is the customization features that makes it ideal for tactical uses. The safety lever is on the left side, making it convenient to reach with the thumb of the shooting hand. The front gas block is railed to accept the front sight with a flip-up sight post. It is also equipped with an M16A2 style birdcage flash hider. All SIG516 models, except the Marksman have 16-inch barrels with a free-floating M1913 Picatinny rail and flip-up iron sights. The 5.56×45mm NATO models accept AR-15 style box magazines, which come in 5, 10, 20, and 30-round variants. The SIG516 Russian variant uses magazines designed for 7.62×39mm AR-15 style rifles. The SIG516 Marksman rifle is hammer-fired and has a two-stage trigger mechanism, while all others have a single-stage trigger. The AR-5 variant from Smith & Wesson has been in production since 2006. The M&P in the name stands for "Military & Police" and pays homage to the famous Smith & Wesson .38 Military & Police revolver. The M&P15 is available in different configurations, including some chambered in 5.56mm NATO/.223 Remington, .22 Long Rifle, and 5.45×39mm. The 16” barrels come with either a melonite lined or chrome-lined 4140 steel rifling and 7075 T6 aluminum receiver with a hard-coat black anodized finish. The Standard model has an adjustable CAR-15 stock and comes with a 10-round or 30-round magazine. The Compliant model is designed for the California market, has a CAR-15 stock fixed in the open position and comes with 10-round magazines. 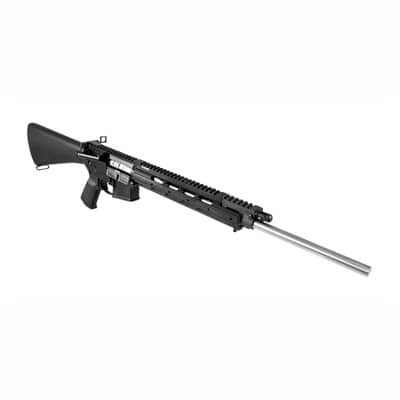 The Performance Center target shooting version has an 18-inch bull barrel threaded to take any AR-15/M16-style compensator, a free-floated forend, integral Picatinny rail system and, ships with a 10-round magazine. Now that we’ve looked at the various models, and variants of both these rifles, let’s examine the differences and similarities between them. Keep in mind that the AR-15 is a successor of the AR-10, and incorporates many of the successful design elements that field tested AR-10s provided. The primary difference between the two is that an AR-15 is bored in 5.56/.223 and an AR-10 is bored in 7.62/.308. The heavier ammo of the AR-10 makes it harder for troops to carry any large amounts, but for big game hunters, it is better to have a large caliber like 7.62mm rifle. The AR-10 makes it easier to bring down large game. The AR-15 is about 3’’ shorter than the AR-10, making it more useful for tactical purposes. The AR-10 is 35.5" when collapsed and 39.5" when extended while the AR-15 is 33.3" when collapsed and 36.6" when extended. In order to withstand the forces of the heavier caliber in the AR-10, the overall weight of the AR-10 is 8.5 lbs., which is heavier than the AR-15, at 7 lbs. Magazine capacity is reduced in the AR-10 because of the larger cartridge as well. 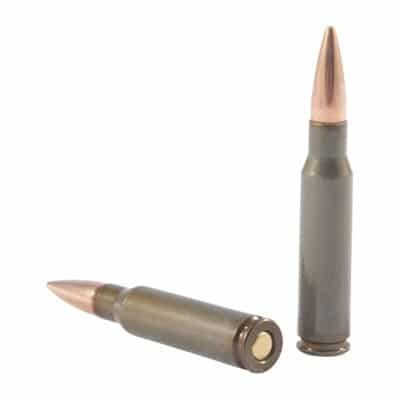 25 rounds is the capacity of the AR-10, compared to the 30 round capacity of the M-15. The modern commercially available AR-10 is chambered for the 7.62x51mm (.308 Win) and features a 16″ barrel with a right-hand twist at a rate of 1 twist per 11.25in. 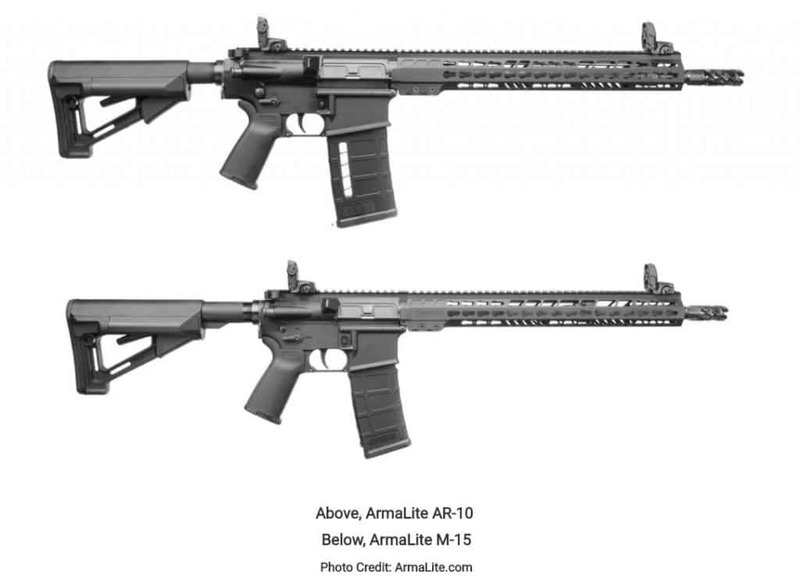 Compare this to the M15TAC16, which is the ArmaLite 5.56mm (.223) tactical rifle. It also comes with a 16″ barrel but has a right-hand twist at a rate of 1 twist per 7in. For starters, AR-15s and AR-10s are extremely similar weapons. They function in very similar ways, are built on similar frames and have some similar parts. Both rifles have barrel lengths of 16 inches. Both rifles are light enough to be carried around by people of any size and strength. The AR-15 employs the same “direct gas impingement” operation as the one used in the AR-10s but comes with a few more developments as compared to its predecessor. The AR-15 can shoot 800 rounds per minute with a muzzle velocity of 3200 FPS being realized to a maximum effective range of about 600 yards. If you’re looking to get the best accuracy and power at long distances, the AR-10 may be your best bet. If you truly need the extra power and accuracy at the range or need something that’s going to impart the maximum amount of force to a target at any range, the AR-10 may be the better choice. Thanks to its longer range and the stopping power of the 7.62mm ammo, the AR-10 is preferred by law enforcers, especially snipers. However, not everybody needs that extra range or stopping power (or the extra expense). 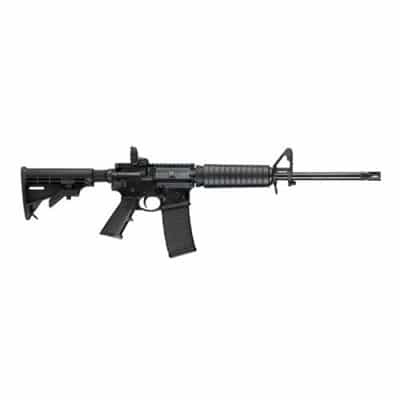 The AR-15 is well suited for home protection, varmint, and other small game hunting, and even security and public protection duties. The advantages of the AR-15 are its versatility, easy availability, access to ammo and parts, and the fact that it is lighter recoiling, cheaper to shoot and easy to maintain compared to the AR-10. You can go to any gun store or even your local supermarket and buy ammo for your AR-15. In emergencies, you can rely on finding ammo, parts, magazines, accessories, and other copies of the rifle itself. If we were to choose one, we’d pick the AR-15 for its easy availability of ammo and parts, and the lighter ammo and portable size which makes it easier to carry. While both the AR-10 and AR-15 are historically significant rifles, the AR-10 became the forefather of the hugely popular and influential AR-15. We’ve covered above the similarities and differences between the two guns, so you know how to distinguish between them. If you’re considering a rifle for big game hunting or need plenty of stopping power in tactical and law enforcement usage, the AR-10 is your gun. But in case you want a reliable, light-recoil, semi-automatic rifle with great accuracy, go for the AR-15, because ammo for the AR-15 is easy to come by and the aftermarket parts are plentiful and of high quality.